Kevin Gupton Jr. (left), Ramona Jones (center) and Maurice Jones recycle unused foods while cutting cantaloupes and avocados. 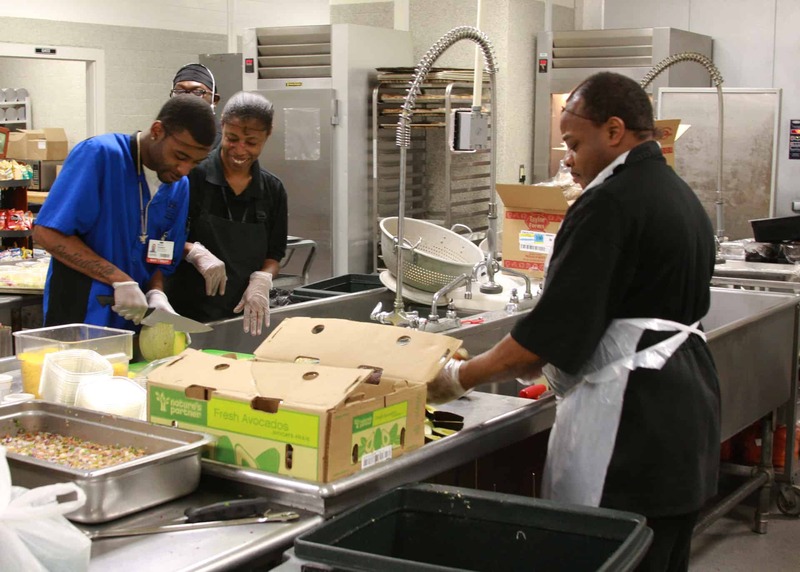 April 6, 2016 | April 6, 2016 | Unused food and food waste from the University of Arkansas for Medical Sciences’ (UAMS) cafeteria is no longer destined for the landfill thanks to a food recycling program that creates an eco-friendly alternative. Since October, UAMS has donated 12 tons of food waste to Organix, a national food recycling organization that produces animal feed. It has also donated about 100 servings of food per month to Potluck, a food rescue organization in Arkansas that provides more than 5 million meals annually to hungry Arkansans. Gupton Jr. recycles parts of a cantaloupe. Food waste sent to Organix consists of produce, dairy, salad bar and bakery items discarded during food preparation, while food donated to Potluck consists of cooked, unused foods. 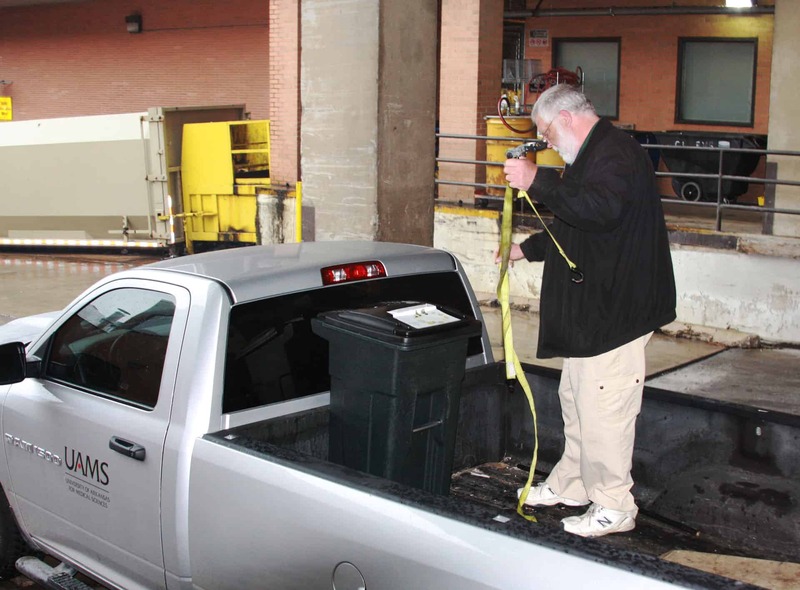 Donn Walters, an inventory control technician, loads an Organix container to be taken to storage until pick up. The program began in the UAMS cafeteria; however, Airo said the university hopes to implement the program campuswide. Airo, who serves on the Little Rock Sustainability Commission and is chair of the commission’s Green City Operations Committee, has been a recycling proponent for years and said he’s always strived to create a more eco-friendly community. “This could not have been possible without Robert’s resourcefulness and our entire staff’s willingness to try out this program,” said Chad Hale, recyclables coordinator at UAMS who oversees the program. UAMS’ food recycling program has drawn interest from nearby hospitals and businesses that have expressed interest in implementing the program.